So excited for a new post! I can’t wait to see that sink polished and in place. 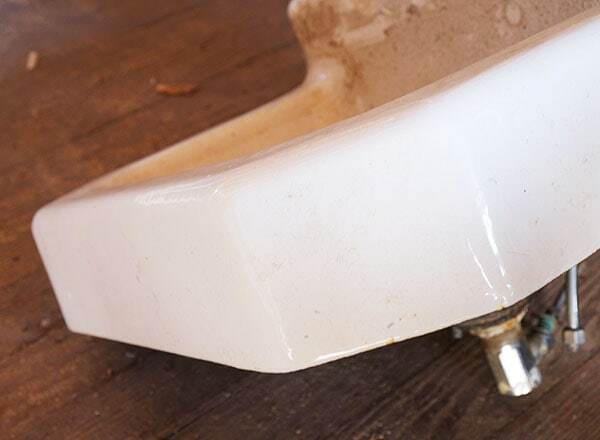 I remember this sink well from when I was a kid and we spent time in many a mid-century tract house in California. Often paired with pink or aqua speckled tile with black trim. It is a true work-horse of a design, and agree that the small ledge will help with having a place to set stuff down. Huzzah for melting snow and more cottage work! Is it sad that–besides the warmer weather, of course–one of the things I’m most looking forward to this spring is reading more Bluestone Cottage posts? I just love those simple little sinks. They still have loads of style, especially over anything new made today. 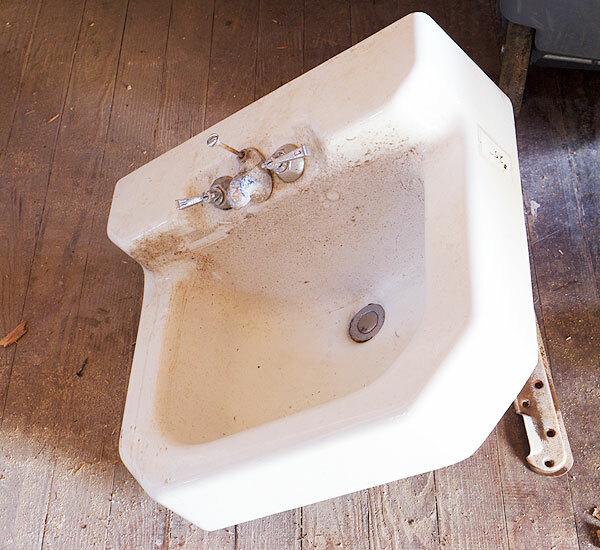 My grandparents installed this exact sink and faucet duo in their cabin in Colorado in 1955. It also had a pair of skinny chrome legs in the front. I’d second the legs suggestion. My childhood home had this type of sink with the support legs. Even If I didn’t regularly climb into as a small child, I think the legs would have been needed to support the fixture’s weight. Love the sink, love the faucet! Props to you. I live out west and was robbed a winter. My parents visited from New York and just ended up staying and staying since you guys had an eternal winter. (Their long visit was a good thing.) I look forward to see your cottage progress! That’s a lovely sink and at a great price too. Is there something missing from the end of the spout? (sorry, faucet to you) It looks very short and like it might be threaded at the end. I’m not really sure! I’m going to ask my plumber about it. It’s possible that it could use a little filter thing, which would be a good way to save on water, too. Typically old faucets just let water run at full blast, which is definitely more than you need to just wash your hands and brush your teeth. Chrome polish from the automotive supply place does wonders: gets rid of rust & polishes up like a dream all at the same time. Good to know, I’ve never tried that! Thanks! Simple, timeless, INTACT-all good things. Glad the winter is ending & you can head back to Bluestone soon. BTW, once things green up a bit I want a full frontal; we never did get to see the planters intact from the street. Thanks! Oh, full frontal you want and full frontal you shall receive. Of the HOUSE, folks. It’s difficult to re-enamel. But you’re somewhat in luck, because the US have a lot more consumer products than Europe. I was in the same quandary in 2013, and all I could find were american products, and the odd local specialist. RustOleum, Homax, Devcon. 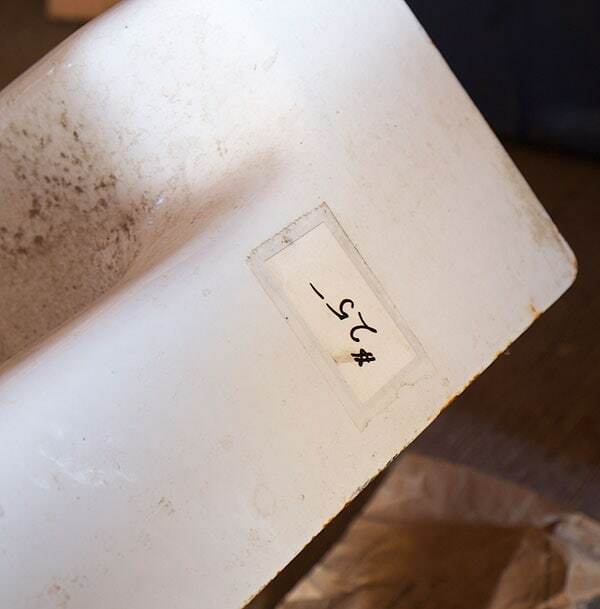 “Tub epoxies” they call it. I’ve been unable to find similar products on this side of the Atlantic. Don’t know if it’s because of toxicity – or it’s because there isn’t a market. Although I doubt it’s the latter. Please let us know anything works! Don’t I know it! It’s frustrating when in the USA you can apparently pop down to your local Lowes or whatever and pick up some magic product whereas here in Europe you have to trawl the internet to find such things IF your lucky and persistent. What is more – (cry for me) – I’m in France where it’s doubly hard. Don’t get too jealous! Those products I’m sure are super toxic and probably why they aren’t available overseas, but they’re not all that great either. They’re not BAD but don’t typically hold up that well over time…the typical trade-off with cheap and fast! Perhaps we should form l’Organisation de Lecteurs du Daniel pour plus Produits Américains en France. LOLDPAF. Another possible explanation is international patents. If one person or company holds the patent for a product, but has yet to expand to other markets, the situation prohibits locals from reproducing it, without offering them the original. Some RustOleum products are sold in France – but in very limited distribution, and the local retailers aren’t at all helpful. According to RustOleum themselves; GiFi and Leroy Merlin. But not all shops, and nobody knows which. RustOleum Tub & Tile should be available in Deutschland via Jansen (http://jansen.de), but I haven’t achieved contact. Considering ESA landing on a comet, DIY needn’t be this difficult. That sink is very pretty, I love the square corners and I really like the taps, although they are in a sad state. At least they have mixer tap potential though, all the vintage sinks I found here had two holes in the far corners for two taps, which meant I couldn’t easily change them to a mixer. And a mixer was the single bathroom requirement my partner had, he was meh about everything else so I have to give him the one thing he was bothered about… Damn his unreasonable fussiness! I love that sink. I agree with Martha – I think these often had chrome legs in front. 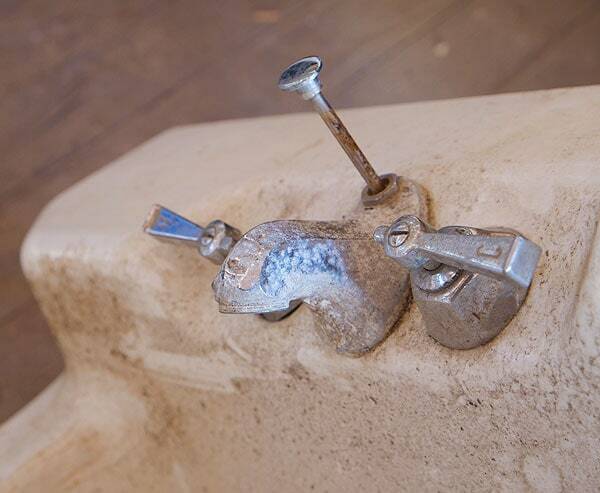 When I tried to reuse a vintage sink, my contractor warned that I’d spend a few $100s getting proper fittings and drain. Do you know anything about that? Maybe it was just my particular sink that I had found for free (and subsequently didn’t use). It really just depends on what the sink came with and how standard or non-standard the various parts for it would be, you know? 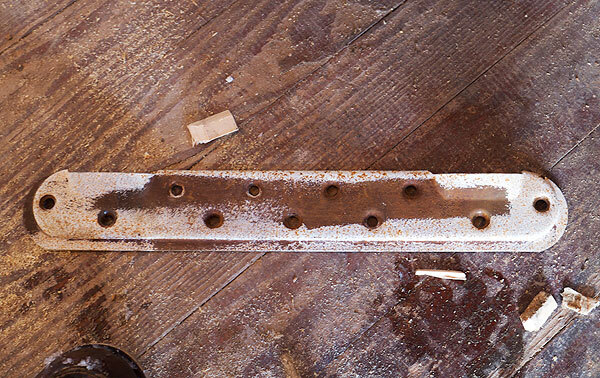 For example, even my kitchen sink from the 50s had to be drilled out a bit (NOT an easy task in cast iron!) because the hole for the faucet was too small for the modern faucet that I installed. Where that isn’t an option, it might take some custom parts or tricky work…it just depends on the circumstances. I’m sorry I don’t know more! Meant to say, glad you’re posting anything! I’ve spent the last fortnight demolishing and rebuilding my bathroom and all I’ve been able to face in between nights’ plumbing is House of Cards and a beer. I am in awe of your ability to write posts when you must be knackered! I am happy to see even a junky old sink from you:). And I trust in its future beauties. I think (as he says) that he’s the only one doing it. It seems to me that this is a business opportunity for a young person–maybe someone you know will consider going in and apprenticing and then you will be able to get all the re-enameling that you like. That’s so funny—I remember reading that now, too! You just have much better recall than I do, oops!! It does seem kind of amazing that he’s the only game in town. I feel like there would be a big demand! I think it’d be cool if companies that are making these products in the first place had some kind of a program for that, too, since they have the equipment and the knowledge and all that. I learned the Kohler actually did it for a bunch of vintage Kohler pieces for a specific rehab project (I can’t remember the specifics…), but unfortunately it’s not a service that’s available to the public. Maybe someday! Yes, I can do heavy cast iron again. All of the old lead based porcelain must be blasted off and new applied and fired. For a 5′ claw foot bath tub I get $1250. For a standard 20″ wall hung sink with short backsplash I get $650. This does not include return shipping or crating if necessary. Very cool! I’m sure this is the last thing you’ll be thinking about, but if you do go for it, I’d love to hear about your results! I love the sink. You are spot on about reglazing. We’re overdue for our ten year checkup! One quick thing to remember when using vintage fixtures. Some plumbing codes require a single faucet with a mixer, so check your local codes before you buy and install a fixture that won’t meet code. We have separate hot and cold on our tubs (that we installed 15 years ago) that wouldn’t be allowed today. This post has opened my mind to thinking about sinks!! I went around my house to check what kind of sinks I have and I figured out it is those gold brassy fixtures that bother me. Now I can fix them–YAY!! The Kohler Villager tub may not suit your beautiful house, but it is new, cast iron, and about $350. I KNOWWWWW. I clearly spoke too soon. Grumble grumble. Love double taps, especially on the older sinks. So much easier to choose my temperature vs. the crazy single handles you have to move ever where to get the right temp. That sink overall is in such nice condition and what a great price. There’s another renovation/design website I follow, http://www.momandherdrill.com, and she redid an old bathtub (maybe cast iron?) using products that are meant for boats … I believe her father built boats. Sorry I can’t provide direct links, my work firewall considers her site “malicious”, which is so hilarious if you actually go to her site, but isn’t really something I can complain about as renovation/design perusing is not technically part of my job. Sigh. I love older sinks. Especially the double taps. I love the old square sinks. Around here, you can find them at the Habitat ReStore at about that price (though usually without the faucet). I actually like the old school plugs instead of the pull up drain – short of the chain breaking, there’s not a lot that can go wrong with a plug and my mechanical drain stoppers always seem to be problematic. True! Those things seem to break all the time. So funny how habitat prices are all over the place! The one up here seems to price stuff like this really high, which is why I didn’t buy it there, although they usually have some nice options. Our Habitat also has a policy of removing all plumbing from this stuff (I think because of concerns about lead), so you always need to retrofit with a new faucet and parts. Oh I LOVE this sink Daniel. I’m searching for something similar myself. Your fantastic blog is providing me with lots of tips and tricks for my renovation project, which is really only just beginning and I already feel totally overwhelmed!!! Keep up the great work and look forward to seeing the finished results. This is neither here nor there–but when I read your blog and see so many salvageable things “thrown away”, I wonder if there are any anti-Grey Garden type houses/people in the world. I imagine that they bought things in the 1950s and kept them pristine and never got rid of them for newer models, Their whole house is vintage but perfect–with a little wear. The sink will look great with legs and one of your mirrors in your half-bath. I want to suggest that you think about having it wall hung without a cabinet underneath, and without legs if it doesn’t appear to have been designed to need any. (I’d look at the underside for evidence of leg marks, and look up that particular sink if you can find it referred to in old house stuff.) The beauty of this in a small bathroom is that you have more leg and foot space when using the sink (and no toe stubbing or toe catching on the skinny metal legs), and visually more floor area, which makes a difference in a small bath – its why wall hung and pedestal sinks work so well in small and tiny bathrooms, despite (and because of) the lack of a storage cabinet underneath. I eventually wanted more storage – (my bath wan’t small – it was just narrow, but long )- so I added a sink skirt – you can just hang fabric panels to the underside of the cast iron ones with magnets. It wasn’t a fluffy, gathered one – just some flat panels of classic Provencal stripy fabric that I hemmed with iron on tape on the sides and bottom (no need to hem the top hidden under the sink.) Gave me tons of space to store stuff below, and still room for my feet to fit under when I was using the sink, and looked great. Also, if the faucets can’t be shined up nice, and you can find a new one that fits, that would be really nice to do for whomever lives there. My sink I loved, even though the enamel was chipped near the drain, but those old faucets had seen their last pretty days – I’d have replaced them if I’d bought the place (though I’d likely have had the sink re-enameled, too. Speaking of spring, please don’t forget to show us how your replantings at the front of your house came up! I have a similar sink in my basement bathroom that I wanted to move up to my 3/4 main floor bath, but because it’s cast iron and super heavy, my people said nay. Apparently, my plaster walls wouldn’t like it. I may look into the chrome legs option though because it’s in really tiptop condition and I’d hate to not recycle a good sink. Please, you are killing us! We need a new post! Ha, second this motion. The world is so boring and shiny without regular MN posts! ME TOO! Working on it!! It doesn’t have to be much. How about some dog pictures? ← The Pantry is Done!